“Please be reassured that every possible care will be taken with the handling of your personal information,” says Georgina Davison, the manager of the town council’s library services in reply to clients worried about recent changes. The new service involves a switch to a new service provider, OCLC, “a global library cooperative that provides shared technology services, original research and community programs for its membership and the library community at large,” according to its website. 1 Enhanced online catalogue with better support for accessing your library from smartphones & tablets. 2 Greater reliability with less service outages, and much faster adoption of new features and services. 3 Better self-service options for managing your account, reserving and renewing items. 4 Improved access to our fabulous range of free online eBooks, eAudio and reference services. 5 Better interconnection with libraries worldwide. Food for thought: Monday 29th August 2016. Cyber War: How hackers are threatening everything from your bank account to the nation’s secrets. “We take digital security very seriously …” she cried waving her Panama Paper in the air – and watching on the TV the fiasco of the 2016 census. The majority of Australia are worried about the privacy of the census even so our data will be kept in Australia, but our library is sending them overseas: That is a worry! “Things are really getting exciting as we get closer to launching our new Library Management System! Since I will not be able to borrow books from overseas, I do not see why my data must be stored overseas. I will now look into the legality of the foreclosure of my library membership as I have done nothing wrong to break the agreement. 2. 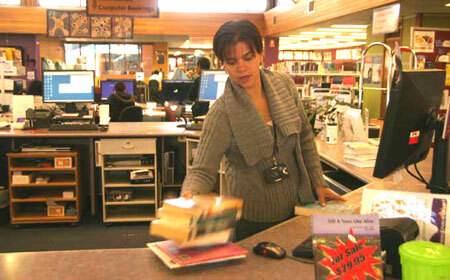 Georgina should investigate the regular outage of OCLC services. 3. I find the services excellent and fast. 5. Does it mean that we can borrow books (hard copy) from overseas? You asked from where the decision to go with OCLC came. This I do not know for sure, but the Alice Springs Library is part of the NT library system which in turn is part of a national system of public libraries. Somewhere up in those reaches would be my guess. You have also detailed some of the expenses incurred by OCLC for their services. The question which then arises is for how much longer will we enjoy the privilege of free public libraries. I suspect for not too much longer. @ Hal Duell: Keeping in mind that “The Kings are kings because we let them be kings” I will not accept. If I can no longer borrow books, so be it. I will follow my father’s advice: put it in my pocket and put my handkerchief on the top. I do not criticise our library or its staff, we have an outstanding facility and I hope it remains so, I query this new system (New world order) and I would like to know if this was discussed at a council meeting. You said the decision came from higher? Who? Questions and answers about compensation of OCLC Trustees: In any given year, total compensation for board service could range from $30,000 for a regular trustee up to $70,000 for the board chair. We are talking US dollars. In addition, trustees are reimbursed for travel based on OCLC’s existing travel policy, whereby air travel is limited to coach rate in most instances. Then we have: As in most organizations, executive compensation is determined by using market data, external compensation consultants, merit and historical benchmarks. Compensation for the CEO is set by the Board of Trustees. The CEO recommends appropriate executive compensation for other officers which is then reviewed and approved annually by the Board. We ratepayers of a country town will help to maintain the “golden calf”. Does our Mayor agree? Yes, Alex Nelson. Guilty as charged. It is from our archive. Solemn promise to get some fresh pix soon! All the best, Erwin, Editor. I like the photo featured with this story, the internal layout of the library has completely changed since it was taken – hmm, when was it? – four years ago? One to add to the historical collection! Good points. I bet you will not get a reduction in your rates if you do not “accept”. First, a couple of disclaimers: I have accepted, and I offer no criticism of our library’s staff or their intentions. This move comes from much further up the food chain. That said, I don’t trust for one minute this push to globalize information services. Think full spectrum dominance, couple it with the recently signed TPPA and then consider how much easier it is to track global reading habits from one data base. “Trust us, your information is never shared.” Nope, trust you I do not. Georgina must be aware that the world wide web which has become the hub of storing and restoring information, considered to be the safest vault, is a mere toy in the hands computer geniuses. If I understand correctly, OCLC (went on their website) focuses on research collections and support, understanding the system-wide library, data science and user studies, and connect people to the information they need. Would I be able to have access to some old books in the Vatican Library? OCLC is a worldwide library cooperative used by more than 54,000 libraries in 113 countries and territories around the world. OCLC is a nonprofit cooperative, funded by its membership’s use of shared services and programs. Their financial plans require them to balance costs, revenues and long-term sustainability. Since 1999, OCLC has engaged in several mergers and acquisitions. The reasons are varied and include preserving member assets, expanding the membership and building presence outside the United States, enhancing current service offerings and reducing the development cost of new service offerings. To do so, they have set the goal of generating revenues over expenses of 2% to 4%. This goal helps them operate as efficiently as possible while investing wisely for the future. As a cooperative it is a business at risk on the global market. In 2010 unfavorable market conditions led OCLC to take steps such as selling its NetLibrary division in 2010, adding to its online services using its WorldCat bibliographic database and offering new Web-based management services. I have concerns and questions about the new system. 1. What will be the cost to our library, and what will happen if the membership to OLCL goes too high and we cannot afford it? 2. Once a member of OCLC who will be really in charge of the decisions taken? Alice Springs Town library is for the community as 60% of its funding comes from the rates payers (I believe). All decisions should be based on the need of this community and not for the internationals. I have been told by Georgina, that if I do not want my personal data to be stored overseas, I will no longer be a member. Would I get a reduction in my rates?